"A Celtic Mother's Love" Birthstone TRINITY CHARM BANGLE: This is by far, such a special piece in our collection. Embracing motherhood! Look at this mother and child forming a heart with our beloved trinity in the center! We will customize your birthstones on this truly meaningful bangle. We will make it the way you order it. 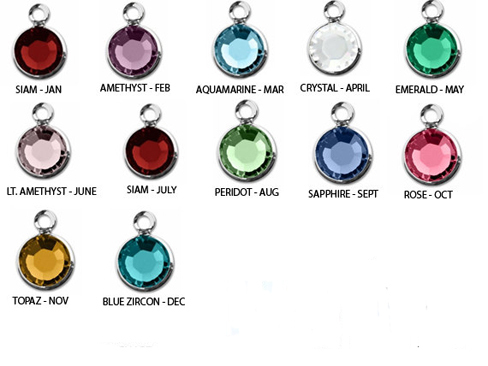 Add as many beautiful and brilliant Swarovski crystal birthstones as you choose now or later. I just love the significance of the mother and child with the trinity. Our beloved Trinity has such a strong faith,heritage significance and meaning that strengthens any Motherhood bonds. Made in the USA the way you want it! 2. Select the qty for each birth-month and add to cart. 3. If you want your birthstones put onto your bracelet in a particular order, please leave us a note during check-out in the note section.